Throughout the ages, understanding and addressing pain has been a matter of serious concern. Historical documents reveal that the great Greek physician Hippocrates incorporated hands-on-treatments for pain some 2,300 years ago. And equally intriguing are hieroglyphics discovered in the tombs of great Egyptian kings portraying ancient bodyworkers treating the pained backs of elderly leaders. Modern-day medical approaches to pain control didn’t begin to challenge hands-on and naturopathic modalities until the middle of the 19th century when morphine was discovered, which quickly became available to surgeons. It was first used as an anesthetic in 1846 and was in great demand during the American Civil War (1861-1865). Later that century, an American dentist, Horace Wells, discovered the pain-relieving properties of chloroform, either and nitrous oxide. Only after 1880 were local anesthetics integrated into the medical community’s pain arsenal. Although a variety of manual therapy procedures for musculoskeletal complaints were publicly popular during this era, the medical establishment of the time became both fascinated and fixated with the new medicinal forms of pain management. Regrettably, modern medicine’s drug-therapy revolution hasn’t provided the panacea for pain from recurring myoskeletal (muscle, ligament, fascia and osseous) pain, and medicinal treatment usually offers only temporary palliative relief. Researches have shown that compression of a nerve does not necessarily produce pain.1 Similarly, a spinal disk herniation may not cause pain, and bones themselves are not major pain generators. So where does the pain come from? This article offers an inquisitive journey through the subtleties of pain management in an attempt to deliver a streamlined therapeutic approach for bringing clients/patients into a state of optimal functioning. Let’s begin by defining pain and its relationship to somatic therapy. Pain may be described as an unpleasant sensory and emotional experience associated with actual or potential tissue damage. Foremost, pain is always subjective. Each of us learns the application of the word through experiences related to injury in early life. Biologists recognize stimuli that cause pain are liable to cause tissue damage. However, many clients report pain in the absence of actual tissue damage. When performing an initial intake evaluation, there is often no way to distinguish whether the client’s perceived pain is due to actual tissue damage. Therefore, if the client labels her experience as pain and reports it in a way consistent with pain caused by tissue damage, it should be accepted as pain. This definition avoids trying pain to the stimulus. Pain is always an unpleasant feeling and is conveyed to the brain by sensory neurons. Pain is more than just a sensation or the physical awareness of pain; it also includes perception–the subjective interpretation of the discomfort. Perception gives information of the pain’s location, intensity, and something about its nature. The various conscious and unconscious responses to both sensation and perception, including the emotional response, add a deeper definition to the overall concept of pain (see Figure 1). Basically, pain is the body’s message that something is awry. Ninety percent of America’s population will experience recurring low-back, neck and head pain. These cases do not necessarily represent diseases themselves but are usually symptoms of dysfunction in associated structures. Most older people will suffer from pain in one form or another. But myoskeletal pain is not reserved for the older adult. Everyday, younger clients enter our offices complaining of aches and pains. In the young, painful episodes occur from time to time and often can be traced back to childhood physical trauma to the joints and related soft tissues. The human body is comprised of the axial skeleton (spine and sacrum), upper and lower extremities, and numerous joints where two or more bones meet. Each articulating surface is designed to provide movement (see Figure 2). The life of a joint starts with movement–movement that should continue throughout life. When asked in class what he considered to be the primary cause of most bodily pain and dysfunction, the great movement pioneer Moshe Feldenkrais quickly responded, “Lack of variety of movement patterns.” It is a well-known truth that the human body lives for motion and despises repetitive tasks. Fig. 2: Each articulating surface is designed to provide movement-movement that should continue through life. When aging joints and supporting connective tissues begin to show wear and tear from prolonged activities such as sitting and standing, symptoms of pain appear. Simply put, a systematic phase becomes symptomatic. 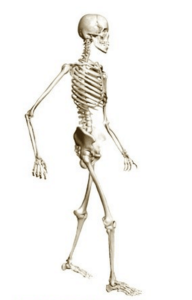 Aging cannot be arrested or stopped, but it can be delayed and most pain can be alleviated with restoration of proper myoskeletal balance and alignment. Even the healthiest among us experience pain once in a while. Pain may last from a few days to years. Prolonged unrelenting pain can really interfere with our lives, making it hard to work, socialize or exercise. Many people resort to drugs for relief–often creating additional problems more serious than the original pain. Pain may arise from any number of situations. Injury is a major cause, but pain may also manifest from illness, it may accompany a psychological conditions (such as depression) or may even occur in the absence of a recognizable trigger. An intriguing new study from the University of Pittsburgh found the brain itself may be a pain generator with peripheral nerve or spinal cord input (see Pain in the Brain). In many cases, symptoms associated with disorders such as plantar fasciitis, dowager’s hump, TMJ syndrome, frozen shoulder and sciatica may not immediately disappear with hands-on therapy. Although steady improvements may be seen, it typically takes time for muscles and joints to heal. Some clients find there is a cycle of repeated improvement and reversal, usually due to fluctuations in psychological or physical stressors. However, with proper treatment, each cycle is usually characterized by greater improvement with less frequent and less severe reversals (see Figure 3). In any case, positive treatment outcomes generally occur faster and better in those clients who maintain the feeling they will improve normally. Defeatist attitudes may be signals that perhaps the individual may not really want to improve. Fig. 3: Psychological and physical stressors can create pain-spasm-pain, leading to functional disability. Therapists should heed the advice of legendary founder of chiropractic Daniel David Palmer: “The body is always working toward order.” Palmer reminds us trust must be placed in the body’s innate wisdom while calling on intent, intuition and therapeutic knowledge to serve as our guide. Successful pain management therapists always focus on facilitating the body’s natural healing process rather than attempting to control it. Can the brain itself be a sole cause of pain in the absence of any nociceptive input from the spine? Pain management researches and manual therapists have suspected for some time that some portion of chronic neck and back pain represents ongoing dysfunction in the brain rather than actual spinal injury. To buttress their case, they point to the fact that it is difficult to identify and verify a specific, obvious, local pain generator in most chronic neck and low back pain cases. While the subject received a painful thermal stimulus. While they believed they were receiving a painful thermal stimulus but were not. While they were aware they were not receiving painful stimuli. Brain wave activity in hypnotized subjects who believed they were receiving a painful stimulus produced an almost identical pattern of symptoms and brain activation as pain in the group receiving the real thermal insult. There was notable activity in the thalamus (the great sensory integrator) and prefrontal and parietal cortexes. “These finding compare well with the activation patterns during pain from nociceptive sources and provide the direct experimental evidence linking specific neural activity with the immediate generation of pain experience.”, researches wrote. This fascinating study provides strong support for the idea that the brain can be a pain generator in the absence of any actual noxious input. The significance of this study is profound for pain management therapists since many functional disorders commonly seen in clinical settings such as fibromyalgia, chronic headaches, and some low back and neck pain cases, may actually have roots based on the mechanism described by Derbyshire. Today’s new brain imaging technology is providing to be an extremely effective and objective way to explore people’s own reported experience of pain. The fact that hypnosis was able to induce a painful experience in the absence of an actual external stimulus suggests there is a neural network for pain–in other words, some pain could really be in the brain. 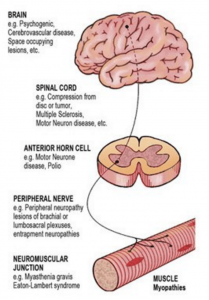 Typically, pain results from a series of exchanges involving three major components of the central nervous system: peripheral nerves, the spinal cord and the brain (see Figure 4, below). Fig. 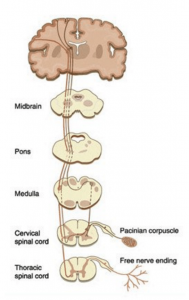 4: Pain develops from a series of exchanges between peripheral nerves, the spinal cord, and brain. LiveArt, Lippincott, Williams & Wilkins, 2005. Reprinted with permission. Peripheral Nerves. 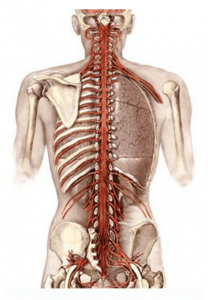 Our peripheral nerves play the grand-daddy in an intricate network of nerve fibers that branch throughout the body. Attached to some of these fibers are specialized nerve endings (nociceptors) that can sense an unpleasant stimulus, such as a cut, burn or even a painful neck crick. We have millions of nociceptors in our skin, bones, joints, ligaments, fasciae and muscles as well as in protective membranes around vital internal organs. Nociceptors are concentrated on areas more prone to injury, such as fingers and toes–that’s why a splinter in the finger hurts more than one in the back or shoulder. There may be as many as 1,300 nociceptors in just one square inch of skin. Muscles, protected beneath the skin have fewer nerve endings. Internal organs, protected by skin, muscle and bone have fewer still. All intrinsic spinal tissues are loaded with nociceptors that can quickly alert the brain to the possibility of insult to vital neural structures. When nociceptors detect a harmful stimulus, they relay pain messages in the form of electrical impulses along a peripheral nerve to the spinal cord and brain (see Figure 5). However, the speed by which the message travel can vary. Sensations of severe pain are transmitted almost instantaneously. Dull, aching pain–such as a chronic headache or an old knee injury–is relayed on fibers that transmit at a slower speed. Fig. 5: When nociceptors (free nerve endings) detect harmful stimuli, they relay pain messages through neurotransmitter along peripheral nerves to the spinal cord and brain. Liveart, Lippincott, Williams & Wilkins. Reprinted with permission. Spinal Cord. Reaching the spinal cord, pain message are met by specialized nerve cells that act as gatekeepers; their job is to filter all pain signals heading for the brain. In cases of severe pain that may cause bodily harm–such as pain from touching a hot stove–the gate opens wide and message take an express route to the brain. Spinal cord nerve cells also respond to these urgent warnings by triggering other parts of the nervous system into action, such as the mechanically-oriented motor nerves. Motor nerves signal muscles to defend against the pain stimulus–for example, pulling the hand away from the hot burner (flexion-withdrawal response). By contrast, messages of a weak pain, from scratches, bumps or bruises, may be filtered or blocked out by the gating process. Several researchers, most notably R. Melzack and P.D. Wall, have theorized on the various systems that are activated through the gating process which allow the brain to dampen pain from local injury or even allow it to burn more hotly through various unconscious reflexes. 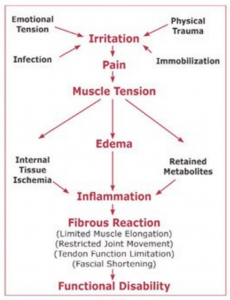 Melzack and Wall’s famous gate control theory of pain 3 will be discussed and treatment modalities presented in part two of the Pain Game series. Therapeutically, it is important to know how sensory message (such as touch) can alter pain perception within the spinal cord itself. Sensory sensations from hand, finger and elbow pressure can overpower, interrupt and diminish pain signals in superficial extrinsic tissues and sometimes in deeper structures as well. When slow, sustained pressure is applied to an injured area during a typical massage session, clients often experience a gradual reduction in pain as pressure-sensitive cutaneous receptors are manually stimulated. In these instances, warning signals sent by the peripheral nerves are downgraded to a lower priority. Since spinal cord nerve cells have the ability to release chemicals that amplify or diminish the messages, the strength of pain signals reaching the brain are affected by touch. Cutaneous receptors in muscles and superficial fascia are calmed by slow sustained pressure. However, for maximum longer-lasting pain relief, therapists must incorporate techniques that simultaneously stimulate articular receptors located in joints. Articular receptors are only stimulated when joints are actively moving as surrounding soft tissues are being manipulated. Therefore any technique can become supercharged simply by adding active client participation. The term enhancers is used to describe client activated movements such as head rotation, deep inhalations, pelvic tilts, wiggling fingers and eye movements. Myoskeletal Enhancers not only increase the neurologic power of the technique but maintain focus between client and therapist as they work as one in the present tense. The myoskeletal techniques shown in Figure 6 and 7, demonstrate highly effective maneuvers to co-activate cutaneous as well as articular (joint), receptors. Since the greatest number of pain-sensing nociceptors are located in and around the spinal cord and joint-related tissues, therapeutic outcomes vastly improve with the addition of client-activated myoskeletal enhancers. Fig. 6: The therapist coactivates cutaneous and articular mechanoreceptors by gliding soft extended finger pads under the sterno-cleido-mastoideus (SCM) muscle belly and onto the anterior scalenes. The client inhales to count of five while gently lifting her head against the therapist’s resistance. This maneuver fires the anterior scalenes (cutaneous receptors) and joint capsule articular receptors, also causing a powerful Golgi tendon release. Upon exhalation, a post-isometric relaxation effect is felt as the scalenes lengthen. Fig. 7: To coactivate frozen shoulder articular receptors and rotator cuff cutaneous receptors, the therapist puts the client in an armlock and brings humerous to the abduction/external rotation barrier. The client inhales and gently pushes the arm toward the hip to a count of five as therapist’s “webbed” hand resists. Upon exhalation, the therapist increases abduction/external rotation to new pain-free barrier. The frontal cortex – the thinking portion of the human brain. The somatosensory cortex – the area that registers all physical sensations. The limbic system – the feeling or emotional region of the brain. Therefore, our awareness of pain is strategically, divided into a complex experience composed of thinking, sensing and feeling. This intricate arrangement allows the brain to respond to painful stimuli by sending messages that promote the innate process of healing. When pain messages reach the brain, two components determine one’s response: physical, sensation and personal makeup. As most manual therapists know, pain arises in many forms: dull, aching, nagging, sharp, jabbing, throbbing, burning, stinging and tingling. Pain also varies from mild to severe. Severe pain produces a greater physical and emotional response than mild pain. Severe pain can also be incapacitating, making it difficult or impossible to sit, bend forward, or stand. Of course, the location of the pain will also affect our response. A headache that interferes with our ability to work or concentrate may be more bothersome–and therefore receive a stronger response–than arthritic pain in a bum knee or a cut finger. Emotional and psychological states, past memories, long-forgotten painful experiences, childhood upbringing and general overall attitude also have a bearing on how we interpret pain messages and tolerate pain. A person’s emotional state may positively alter and improve even a severely painful experience. This result was illustrated in a few studies comparing formerly wounded war veterans with men in the general population. Even though the men in both groups received the same kind of surgery, the combat veterans required less pain medication that the control group–perhaps they considered the surgery a minor matter compared with what they had experienced in combat. It is obvious athletes also have the ability to condition themselves to endure pain that might incapacitate others. Many of us were raised in a cultural settings where the grin-and-bear-it or bite-the-bullet mentality prevailed. These attitudes may actually cause people to experience less discomfort than those who focus on their pain or are more prone to voice their complaints. Allows us to avoid dangerous situations. Helps prevent further tissue damage. Pain initially moves us away from dangerous situations and noxious stimuli. As we attempt to escape pain-producing stimuli following a bodily insult, we avoid further damage. Finally, pain promotes the healing process as we take greater care to protect an injured body part from further damage so to lessen the experience of greater pain.